Nowadays, the life veins of highly automated industrial production come together in the switching cabinets used in the electrical distribution and control and safety technology of the production systems. The sensitive electronics involved are given the best possible protection against faults and mechanical damage by the control cabinet body. But the control cabinet needs to be sealed off too. This is where the 2-component Fermapor® K31 polyurethane foam sealings from Sonderhoff Chemicals come in. They seal off the control cabinet body and doors so that dirt, dust and moisture are unable to penetrate the interior and damage the electronics. The faults that such effects can cause could result in production downtimes that are invariably associated with high costs. Sonderhoff Chemicals develops and produces special sealant materials for polyurethane foam seals used in a variety of applications in the context of control cabinets and electronics housings. They offer a wide range of characteristics according to the specific type of material selected: short assembly and tack-free times thanks to very fast reacting Fast-Cure foams, high flame protection compliant with fire safety standard UL 94 HF-1, suitable for indoor or outdoor use, excellent elastic recovery properties of the foam seals following compression and excellent sealing properties based on testing classifications defined by NEMA for North America or the IP classes (ingress protection) in Europe. These sealing properties increase the protection of electrical and electronic components in control cabinets against dust, rain, splash and stream water, as well as fire. The fast reacting foam seals from Sonderhoff for the sealing of control cabinets and electronics housings allow short curing times to be achieved. They can be adapted to the customer's production speed and application process cycle. 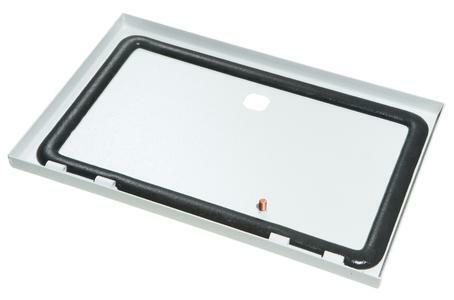 With the ultra-fast, 2-component Fast-Cure Fermapor® K31-A-4530-2-B-FC polyurethane foam seal for indoor control cabinets, the sealing surface is tack-free after just 3.5 minutes* and the assembly time can be reduced by more than half from its previous approximately 60 minutes to around 25 minutes*. 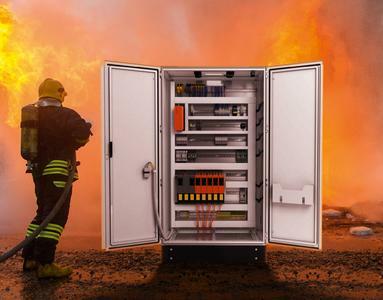 For control cabinets that are permanently exposed to the influences of weather, Sonderhoff offers special Fast-Cure foam seals that have been tested outdoors. 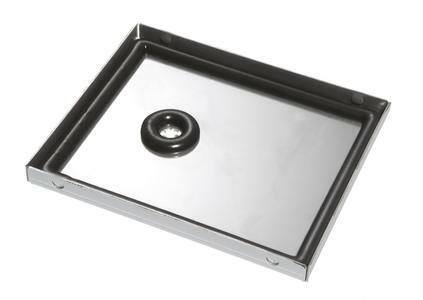 The ultra-fast-reacting FERMAPOR® K31-A-6065-1-B-FC foam seal used for this can be installed after just 20 minutes* (standard 60 minutes). And the tack-free time for this Fast-Cure foam seal is now around 3 minutes*, compared to the previous time of 12 minutes. The advantage: shorter tack-free times mean that further processing steps can start sooner. During the development of seal formulas, Sonderhoff especially takes into account the specific production concepts and application processes used by its customers. In the development of 2-component control cabinet seals, for example, it is important to coordinate the reaction behaviour and pot time until the start of expansion, as well as the curing time of the foam seal, as precisely as possible with the customer's production processes in control cabinet assembly. The installation time is also crucial in control cabinet assembly, i.e. the time needed for the foam seal to cure and the time from which the foamed components can be put together to create a control cabinet. Until final assembly, the individual control cabinet components - side pieces, back wall and doors - are usually stored in piles until they are fully cured. If the new control cabinet seals from Sonderhoff enable the installation times to be reduced by at least half, significantly fewer components need to be stacked up for a shorter length of time. This saves on storage space and warehouse costs. Investments in tempering furnaces, such as the type used to cure 1K foam seals, are not necessary thanks to the significantly faster reaction behaviour of the 2-component Fast-Cure Fermapor® K31 foams. The type and characteristics of the substrate play a major role in the surface adhesion of foam seals. The new Fast-Cure foam seals generally adhere very well to control cabinet housings that are usually coated with powder paint. This is often not the case with stainless steel housings. Here, however, pre-treatment with an adhesion-promoting primer can produce good results. Plastic housings also exhibit adequately good adhesive properties; however this depends greatly on the type of plastic used. Foam seals on plastics such as ABS, PC or PA6 generally adhere well, whereas PE, PP, PS PVC or PMMA often require pre-treatment. In this case, primers or thermal processes such as flame treatment, plasma or corona treatment are usually used. In the case of electronics housings made from plastic, it is usually sufficient for the foam seal to be held in the groove. Essentially, the surface adhesion must always be checked on an application-by-application basis. The seal foamed control cabinet side pieces, back walls and roof elements are installed during final assembly and then not opened again. In this case, assembly adhesion in association with the component construction is in many cases sufficient. The cabinet doors, on the other hand, are opened and closed frequently, which means that special requirements apply to the elastic recovery of the seal used here. Under test conditions (80° C, 50% compression, 22 h) the indoor foam seals recovered by around 92%. In the case of outdoor foam seals, the elastic recovery is even better, at around 95%. This means that the foam structure is able to maintain a consistently high sealing effect even after frequent opening and closing of the doors. 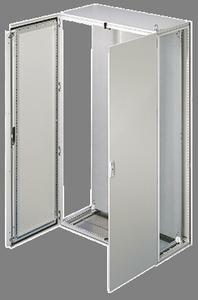 The Fast-Cure control cabinet sealings for indoor or outdoor use are water-repellent. The water uptake in their compressed state at room temperature is less than around 3% for outdoor foam seals and around 5% for indoor foam seals. 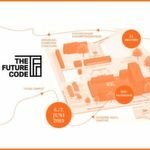 This means that protection classes up to IP 67 can be achieved, depending on the component design and the foam system used. 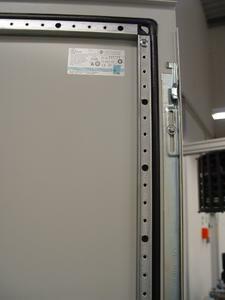 In North America, the sealing of steel switching cabinets with Fast-Cure control cabinet seals from Sonderhoff is tested in a system test in accordance with NEMA 4. The control cabinets are subjected to a water jet test for this, in which all columns with seals are checked for tightness with a water jet sprayed at a rate of over 240 l/min and for a testing time of 40 minutes. The test also examines the protection against dust. One element of the broad spectrum of properties of the foam seals from Sonderhoff Chemicals for the sealing of control cabinets and electronics housing is the Fermapor® K31-A-45C4-2-UL-FR polyurethane foam seal with flame protection. It fulfils fire safety standard UL 94 HF-1, the highest fire safety class for polyurethane foam seals in the USA, and is therefore classified as self-extinguishing without burning droplets. It also complies with US testing standard UL 50E for control cabinets and electronics housings in non-explosion-protected zones, as well as UL 508 for the safety of electrical switchgear. All three are key requirements for the marketing of electrical equipment and other electronic applications in the US, Canada and Mexico. Perfectly sealed control cabinets that ensure high-performance and fault-free electrical distribution are not only used in industrialised nations. They are one of the prerequisites for the industrialisation of developing countries all over the world. The plastic and metal processing companies in these countries can source everything they need for the sealing of control cabinets and electronics housings from the Sonderhoff group of companies, from the broad spectrum of properties in Sonderhoff Chemicals' sealing products to the mixing and dispensing systems for the foaming of components from Sonderhoff Engineering. The Sonderhoff group of companies with its headquarters in Cologne / Germany is the leading system supplier and manufacturer of polymer sealing, gluing and potting formulations, dispensing machines and automation concepts as well as for contract gasket application services. The Sonderhoff System combines chemical and technical competence with creative engineering know-how in the fields of mixing and dosing of sealing material and process engineering provided with a comprehensive service and contract manufacturing. 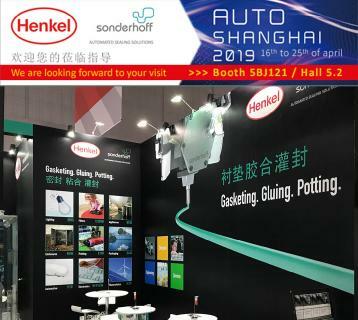 The sealing products from Sonderhoff are used for foam gasket, gluing and potting applications of various industrial components, for instance, from the switch board enclosure, electronics, automotive, air condition, filter, photovoltaic, packaging or household appliance industry. 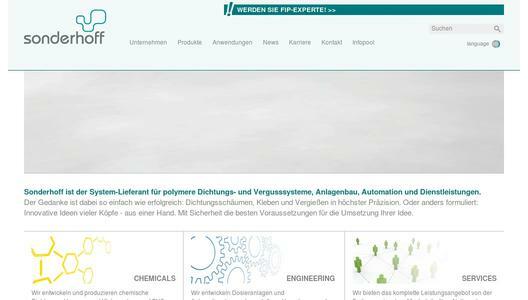 Sonderhoff Chemicals GmbH (Cologne / Germany) develops, produces and distributes worldwide polymer sealing, gluing and potting systems on polyurethane, silicon and PVC basis. Their performance is based on the experience of more than thousand formulations. The sealing material is applied onto structural components and modules of OEMs and industrial suppliers by the FIPFG / FIP (Formed-In-Place Foam Gasket / Formed-In-Place) technology. 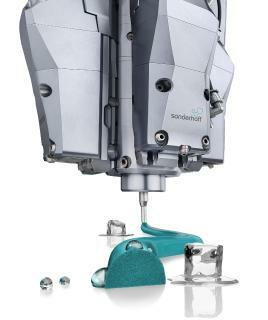 Sonderhoff Engineering GmbH in Hörbranz / Austria develops and distributes all over the world low pressure metering systems, from stand-alone dispensing machines to automation concepts according to customers' specifications for fully automated production lines of foam sealing, gluing and potting. Sonderhoff Services GmbH (Cologne / Germany) and Sonderhoff Polymer-Services Austria GmbH (Dornbirn / Austria) have positioned themselves as toll manufacturers for foam gasket, gluing and potting applications with the highest precision. Their services comprehend individual sampling of prototypes as well as sealing, gluing and encapsulation of parts, from pilot application processes and small batches up to serial production for OEMs and industrial suppliers in Germany, Switzerland and Austria. Partner companies undertake the contract manufacturing of foam gasket, gluing and potting for the customers in Great Britain, Spain, Poland, India, Singapore, Japan, Korea and Brazil. The affiliates of the Sonderhoff group of companies in Italy, the U.S.A and China offer the complete range of sales, technical and contract gasket application services to the OEMs in these countries as well as production and sales of material systems and the distribution of dispensing machines from Sonderhoff.